Do You Know the Muffin Pan? 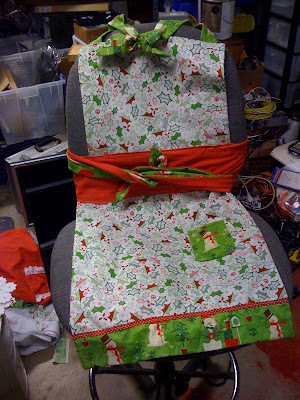 : Finished Apron for the Swap! Finished Apron for the Swap! I won't spoil the surprise by showing the tuck-ins cause if my apron swap partner takes on look at them she'll know exactly who it's for! It is reversible with an empire waist wrap. A friend described it as being something a drunk christmas elf threw up. It is quite loud and festive but I LOVE IT! It has three different fabrics and a ribbon accent. And a pocket. So take that naysayers! I want a brand spankin' new sewing machine. I saw your post on FAS about your boyfriend fixing your machine. That is crazy he could do that. I greatly enjoyed reading your post. I have participated in FAS in the past but took a round off. I hope Santa brings that new machine for you!! My Giants Won the World Series! !